*We like to share things we find helpful with our readers, so this post may contain affiliate links. If you click on them, we will receive a portion of any sales made, at no additional cost to you. We appreciate it! See our Disclosure page for more details! OK, so maybe it wasn’t technically our FIRST. We did fly with Brendan from Florida to California when we adopted him, two weeks after his birth. How were we going to install the infant car seat on the plane? Would his ears hurt on takeoff? Will he scream loudly the whole time and annoy other passengers? Will he get sick from all the germs flying around? What will we do if he needs a diaper change? 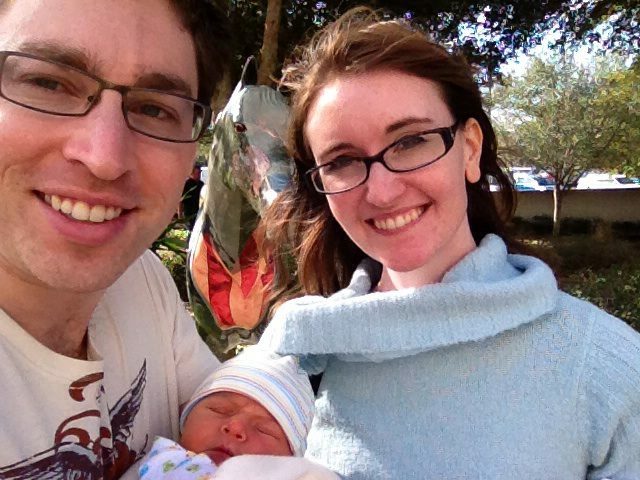 Our very first picture as a family, as we left the hospital where he was born! Which Airline is the Most Family Friendly? There are lots of factors to consider when choosing an airline. 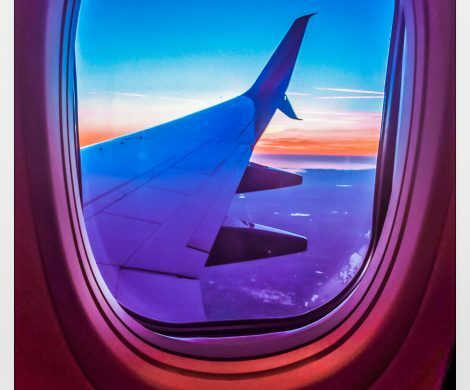 You can go with the cheapest fare, but you might be surprised by hidden costs like checking baggage or bringing a carry on that makes the low ticket price not worth it. We researched quite a few airlines and compared ticket prices. In the end, we stuck with our favorite: Southwest Airlines. Not only is Southwest usually the lowest fare, but they allow two free pieces of checked baggage, along with a carry-on and a personal item. This meant that we could bring backpacks full of books and snacks easily, and there were no hidden bag fees. It allowed us to get an accurate idea of the cost of tickets before we booked. Some travelers might not like the idea of non-assigned seating. However, we find that it generally works out in our favor. Because of his work trips, Josh has frequent flier A-list status, so he tends to board in the first group and usually grabs an aisle that he likes. We pick a place right behind the wing, as it moves the least in flight (I sometimes get motion sick). Families with young kids get to board between the A and B groups, so you’re always going to find seats next to each other, too. Finally, we have found that Southwest’s Customer Service is the very best. The booking process was easy, and the woman on the phone that helped us rearrange some flights was very helpful. 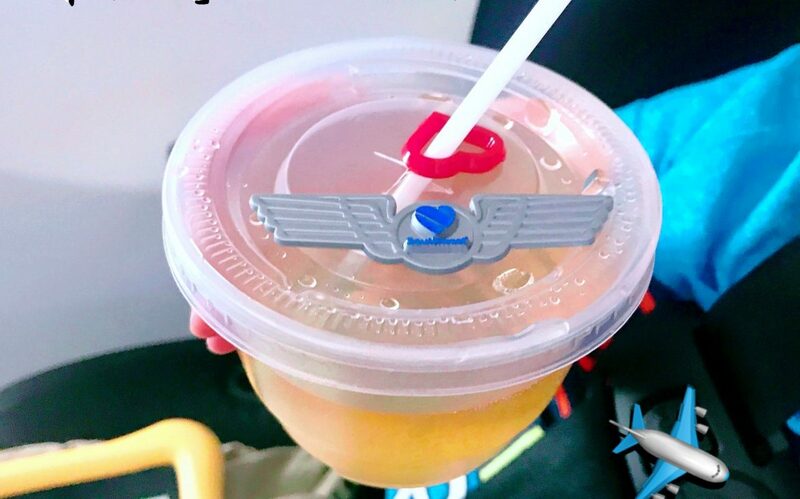 Every flight attendant that we encountered was pleasant and kind, and they often took extra steps to make the kids smile, like serving them drinks with cute flight wings and hearts attached! 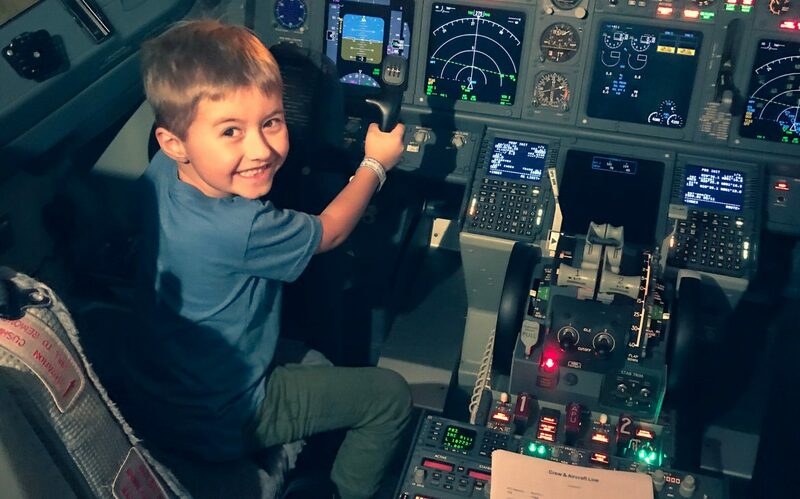 At one point, when we were disembarking after a long flight, our 6 year old peeked his head into the cockpit to see what it looked like. The pilot could have just waved and let him look, but instead he took the time to invite him in and let him look at the controls. He even got to honk the horn! 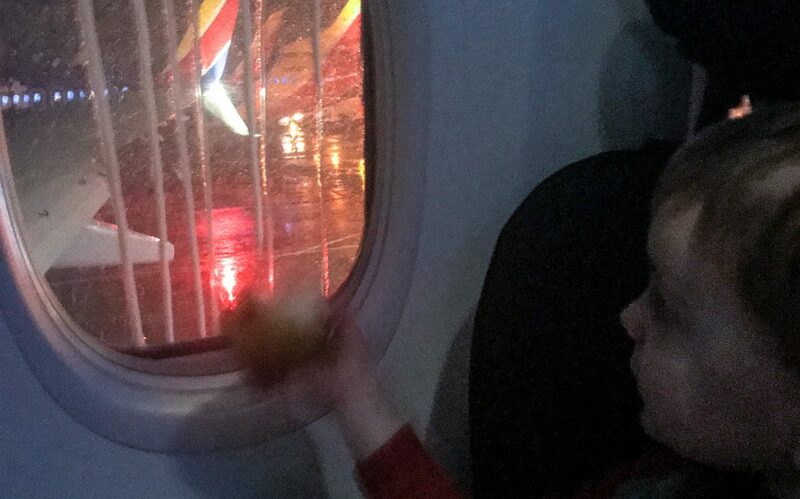 Taking that extra five minutes to totally make this kid’s day wasn’t required, but the pilot did it anyway. We were very grateful, and Brendan was clearly thrilled. Great job, Southwest! You’ll definitely always be our first choice. This part can be quite an ordeal. 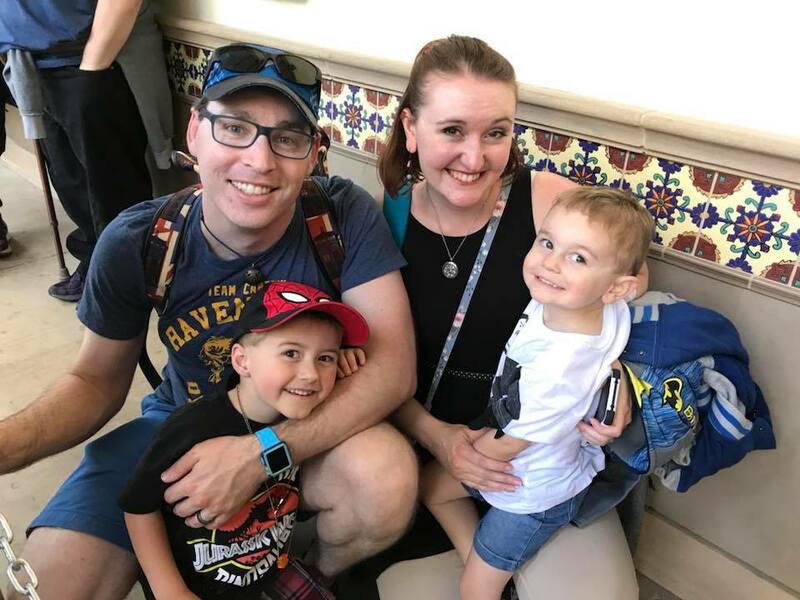 With crowds and lines and the need to move quickly through security, it’s easy to get frazzled when your kids dawdle or don’t follow directions. At 6, Brendan was old enough to push his own carryon through the airport. This freed up our arms and gave him a sense of responsibility. It also kept him from wandering too far from us! Just to be safe in case we got separated, however, I used these waterproof and reusable ID bracelets on the boys. They had cute designs, and I could put our name and number on them. It’s always good to teach kids what their parent’s names and phone numbers are in case they get lost, but as we discovered in the past when Brendan walked off at a comic convention and thought he was lost (we were only a few feet away, watching to see what he did when he realized we weren’t in the same place), sometimes little ones just burst into tears and can’t calm down enough to tell a kind adult that information. This is a great way to have that backup! 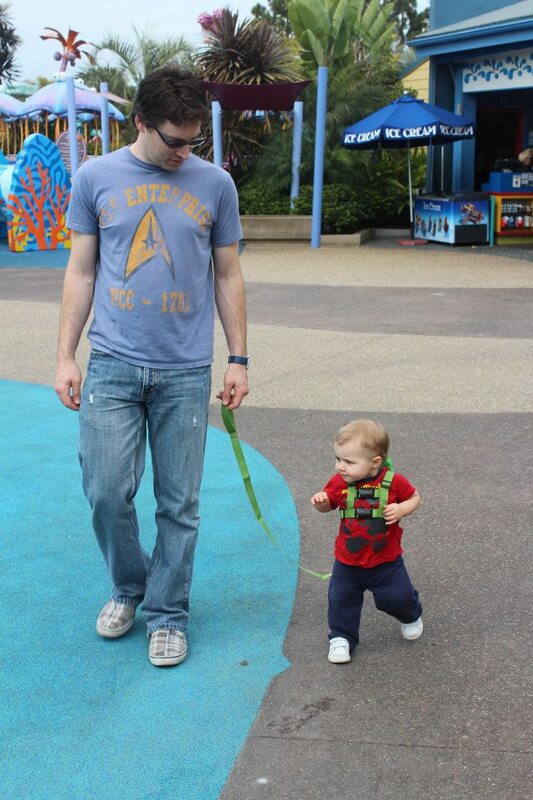 They came in handy at theme parks, too. 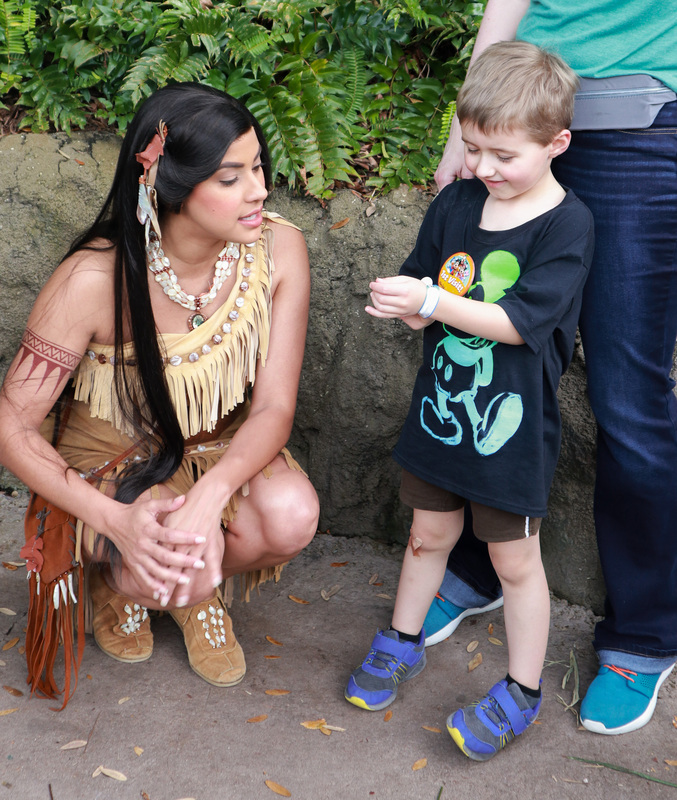 Also, here’s a little tip we relied on: you don’t have to use your stroller as a stroller! Don’t check it as luggage. Keep it with you and check it at the gate, and it’ll be easier. Yep, that chair on wheels is basically a free luggage cart that goes directly to the loading area. 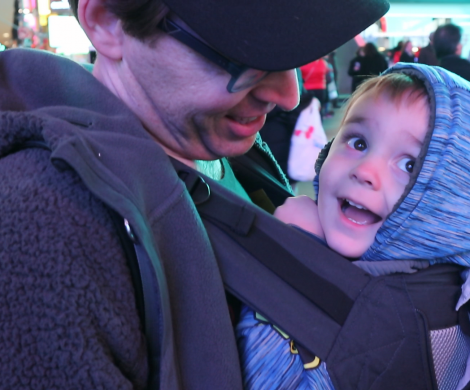 We piled our heavy suitcases onto our stroller to help us get it from the parking lot to the airline counter, and after we checked those bags, it was useful for keeping all our carryons together and getting tired kids through the terminal down to the rental car area. In some airports, you might have to use an elevator to get up to security. The benefit of having a stroller in this case is that you might get waved through to a shorter security check line, because the stroller can’t always weave through the queues. Score! Once you get to your plane’s gate, you’ll have to check the stroller. The downside of this is that sometimes it can get banged around a bit. Even though our stroller is old and has seen better days, I still didn’t want it getting all dirty and destroyed more. We bought this XL stroller protective bag to help with that, and I’m glad we did…by the time our trip was over, that poor bag had all kinds of scuffs and dirt and scratches! 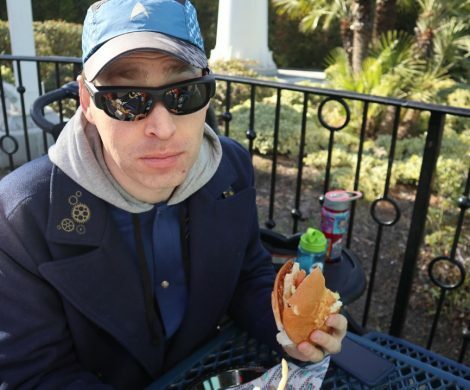 I’m glad that didn’t happen to the stroller itself! Lap Child, Airline Approved Car Seat, or Sit By Themselves? The next decision parents flying with young kids have to make is whether they want to save money on plane fare by having their toddler be a lap child (kids under 3 can ride on their parent’s laps without purchasing a seat), having them sit in their own seat like an adult with no harness, or bring along an airline approved car seat. Our sister-in-law, who had visited Florida a week before us, flew with her 2 year old on her lap to save money. It CAN be done! I knew that my youngest was extra squirmy though, so I didn’t want to try that on such a long trip. We opted to just bring a car seat, knowing we’d need one for getting around the city at our destination anyway. 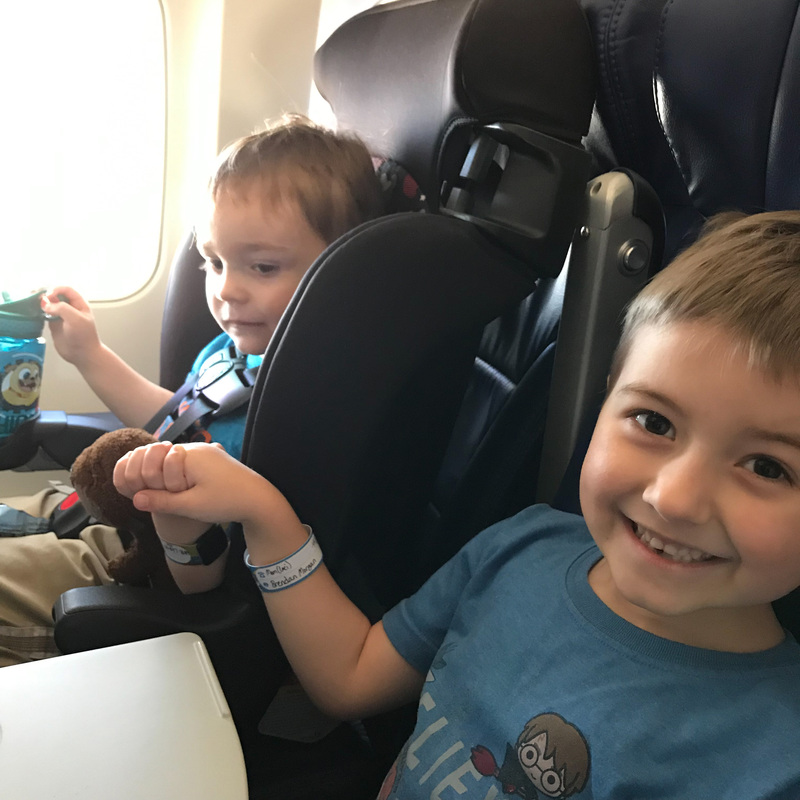 We chose the Cosco Finale Booster Seat, which we reviewed here: “What Are the Best Travel Car Seats for Kids?“. 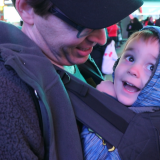 We also figured that having a squirmy 3 year old firmly secured with a 5-point harness would make everyone happier! It also made me feel better knowing he was very safe, because the flight to Orlando had a good amount of bumpy air. 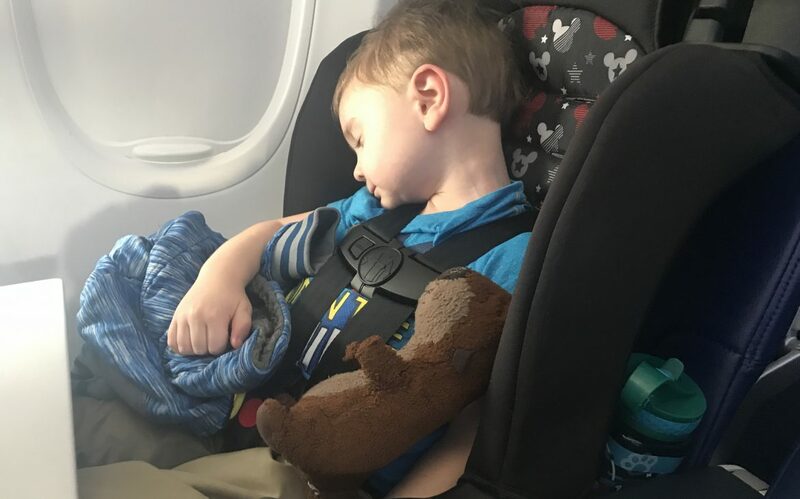 I also think this was a good call, because it allowed him to comfortably take a nap in the car seat like he usually does in the car. I don’t think he would have been willing to sleep as easily without it, or else he wouldn’t be safely in the lap belt if he laid down. Note: There ARE some portable airline-approved harnesses, like this one, that attach around the back of a basic airplane seat, but it is quite expensive. If traveling light without a car seat is a priority, however, it may be a good option to keep your child feeling secure. In the past, airplanes had ports on the seat armrests where you could plug in a pair of wired headphones to hear music or the audio of a movie. That’s no longer the case on most planes, so wired earbuds are not a necessity any longer. Bluetooth that pairs with your device is the standard, but remember that you need to have everything be well-charged before the flight. A dead pair of Bluetooth buds is useless, so I prefer to bring some low-tech wired buds as a backup. Test your headphones before you leave home!!! We made the mistake this trip of NOT doing that, and were almost stuck without headphones. I had packed two pairs of some cute foldable “designed for children” headphones, thinking that they were the perfect choice because of their compact size. However, I forgot that many kids headphones have built-in volume control that limits the output so that it doesn’t get too loud. While this is all well and good in most everyday situations, with the loud ambient plane engine sounds, it made those headphones totally useless. You couldn’t hear a thing, and my kids nearly burst into tears when they couldn’t get it to work right and were faced with having to watch silent movies. Luckily, their mama tends to overpack, so I found an extra pair of plain Apple earbuds in my Mary Poppins-like backpack. Brendan’s ears are big enough to use them, but they fell right out of Toby’s small ones, so that was a little frustrating for him. Next time, I’ll pack some louder over-the-ear headphones for the plane! Getting sick while on vacation? Ain’t nobody got time for that. Unfortunately, you can’t do much about the people sitting around you. Unless you want to wear a germ-preventing face mask, which have their own problems (they’re really not that useful for stopping germs, since they’re only effective if you don’t remove it. They fog up my glasses and get too stuffy), all you can do is strengthen your own immunity to prevent catching a bug. Once you’re in the airport, wash your hands A LOT. Bring hand sanitizer to use before you eat your snacks. We also brought antibacterial wipes in our carryon, and wiped down the arm rests and seat back trays on the plane before we used them. No one got sick after this trip, so I count that as a win! He spent the first hour of the flight holding my hand in a death grip. He was calm, just didn’t want to let go of me. 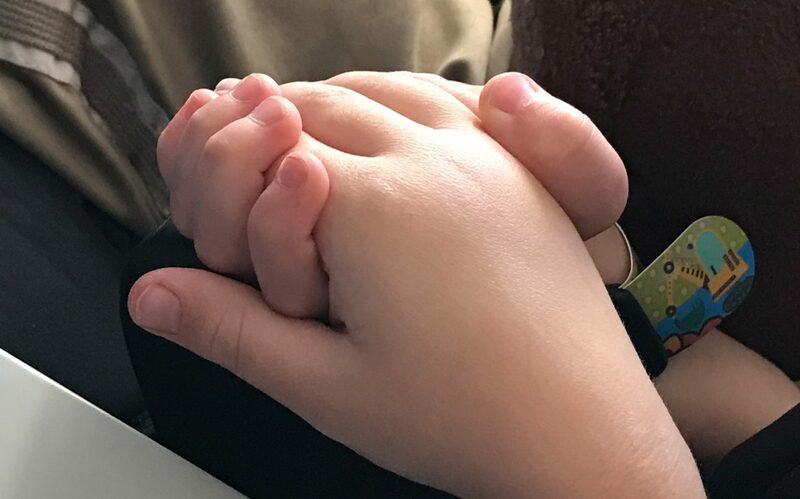 I thought it was sweet that Brendan was willing to hold his hand for a while too, to give mom and dad a break. One of our children is quite a thrillseeker, tackling every roller coaster he’s tall enough for. The other is a bit of a worrier. Every time there’s a loud surprising sound, he tenses up and runs to us for a hug. Knowing this, we tried our best to prepare him for what going on an airplane might be like. There are all sorts of fun books you can find at the library about how planes work. We even found some episodes on Youtube of Popular Mechanics that walked kids through airplane travel. They loved that! Giving your child knowledge helps them be less afraid. Tell them that it’s a big adventure! With a rapid pressure change, young kids can sometimes freak out a bit at the feeling of their ears being full. A good way to help relieve that pressure is to help them make chewing motions with their jaw during takeoff and landing. An older child might chew gum, and a younger one might get a packet of gummy bears or fruit snacks to keep that jaw working. Give your kids a feeling of control by explaining what is happening at each step. “Now they are turning on the air in the cabin.” “Now the flaps are going up on the wings,” etc. When it’s time to take off, tell them to count it down with a “Blast Off!” Then smile and make it a fun ride. We took the time to explain every step, including how they de-iced the plane in Chicago. It helped Toby not be afraid when the big hoses hit his window! This one is tough. Our youngest is potty-trained, but still doesn’t give us much warning when he needs to go. By the time we hear “I have to go potty!” he is already squirming. We have maybe a minute or two to make it to the bathroom, or there’s cleanup to do. But going to the bathroom on planes is not easy when you have young kids! This flight had long periods of turbulence, so the “keep your seatbelts on” light was pretty much constantly on for four hours. If your child is young enough, you may want to put them in Pull-ups or a diaper, even if they’re potty trained. It’s just easier for everyone if they aren’t able to get out of the seats fast enough and have an accident. Otherwise, use your best judgement on when the safest time to make a trip to the plane lavatory is. Try to pick a moment where the plane is relatively stable, and there isn’t a long line. 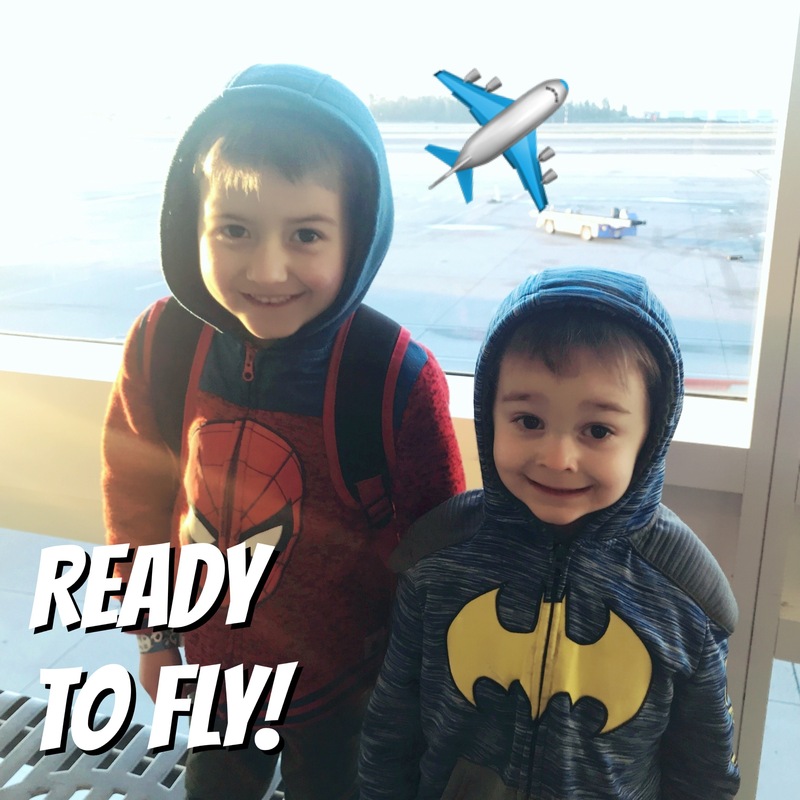 You’ll want to keep them safely in their seat as long as possible when there’s choppy air! Pick a good moment and get in and out of there as fast as you can. Also, make sure to let them know that the flush and the sink noise is MUCH louder than in most bathrooms. That rush of air can definitely startle your kiddo, so prepare them before you hit the button to avoid a scare! Many a parent has worried about flying with their kids, and it’s usually NOT because they think their kids will have an issue with the trip. 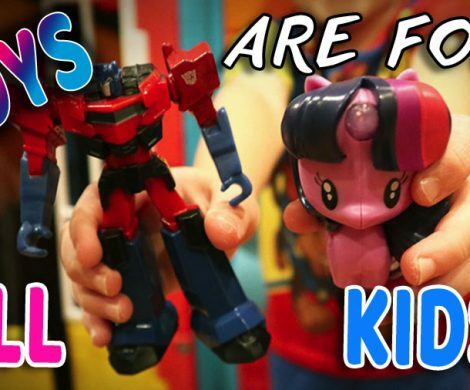 Because of our society’s unrealistic expectation that kids should be perfectly behaved in every public situation (ha! ), or perhaps hearing comments from childless friends about that “time they were stuck next to a screaming baby” on a plane, parents can tend stress about keeping their children quiet. Let’s be honest with each other. Kids are sitting inside a loud, stuffy, unfamiliar environment, surrounded by strangers. Sometimes they’re too young to understand why their ears hurt or they are suddenly tilting. Planes can be scary! (Heck, I still grip the seat with white knuckles when there’s turbulence) Add to that the fact that they might be exhausted from shlepping through the terminal all day, and you’ve got a recipe for brewing disaster. Try not to take it personally if people nearby you roll their eyes or whine about being seated close to your child. Don’t feel like you have to apologize for your child being there. (No need to hand out gift packs of earplugs!) Your family has every right to travel too. I think people forget what it’s like to be a child sometimes. 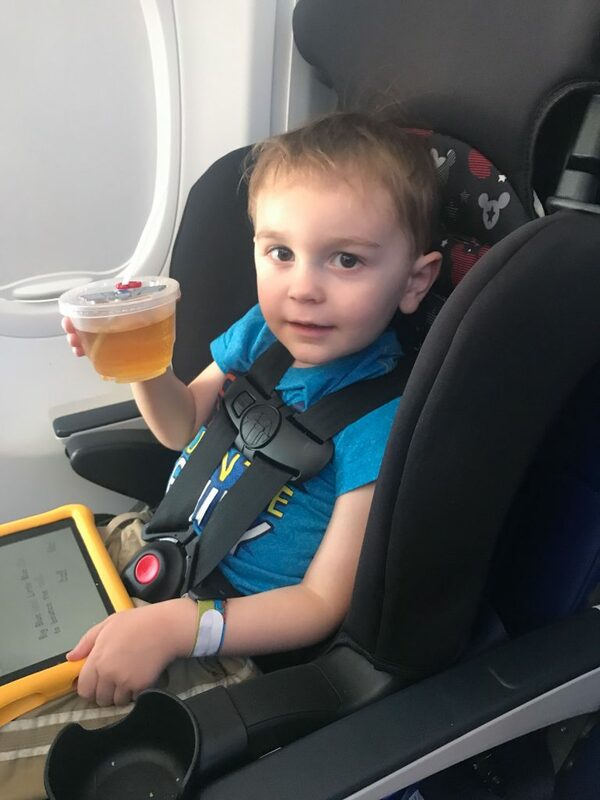 On one leg of our journey, the lady in the row in front of us wheeled around and angrily told my 3 year old “stop kicking my seat!” Trying to ignore the fact that this woman had yelled at my little child instead of addressing me (NOT. OK.), I calmly told her that he had to go potty very badly and I was trying my best to unbuckle him as fast as I could. He simply couldn’t help it. She sat down with a sheepish look. She hadn’t even considered that this might be a sweet little boy who WASN’T diabolically trying to annoy her. 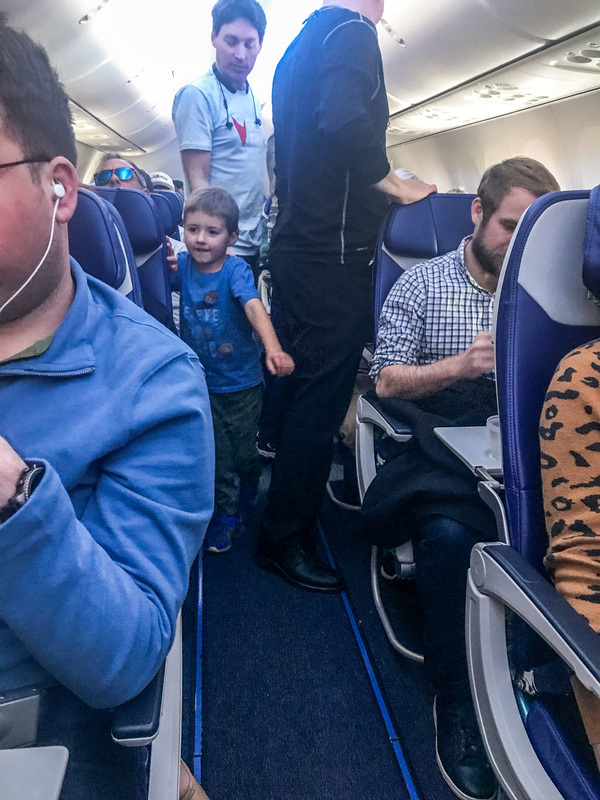 Honestly, I wouldn’t have minded if she had looked behind her and asked nicely…I don’t want my kid kicking seats on purpose, and I want my kids to respect other’s space! Obviously, do your best to make your child comfortable and minimize disturbances to those around you. Don’t flat out ignore your child screaming their heads off and pop in earplugs while you read a book (yes, people do this). That small moment of realizing that not everyone is judging you can make a stressful trip just a little bit easier. And remember, YOU may be perceiving things differently than it really is. 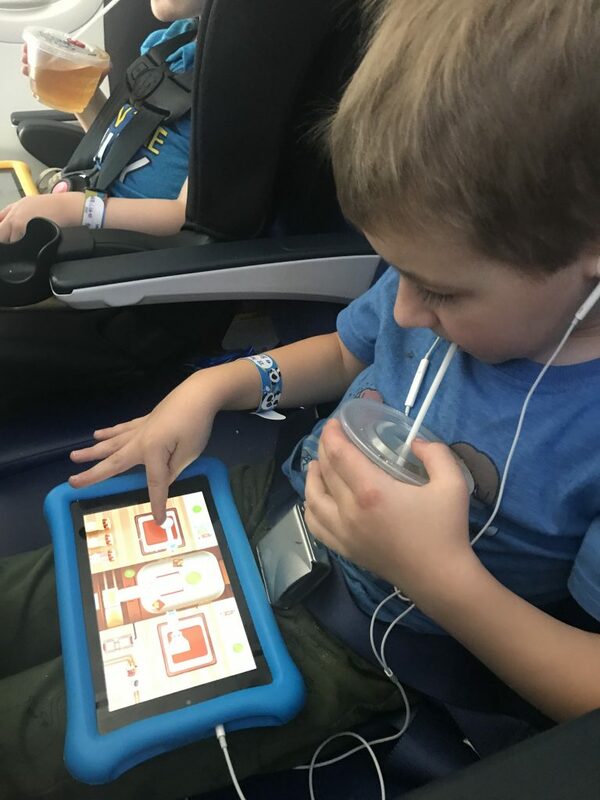 On one flight, a large man kept turning around and staring intently at me and the boys every single time they made any noise at all. They weren’t being obnoxiously loud, just talking at full volume like kids do. It got to the point where I was unsuccessfully shushing them constantly, getting a bit uncomfortable, just waiting for the moment he was going to make a rude comment or yell at us. All these scenarios of what I would say ran through my head, and I was super stressed about keeping the kids quiet. Then I looked closer. I noticed that the man had on thick noise-canceling headphones. He was tapping his face and the window nervously. The older woman (mom?) seated beside him was asking him questions and comforting him, explaining things about how flight worked. He might be autistic, I realized. When the plane landed and we all stood up, he looked at us again. “I’m sorry if they made noise,” I said. The man smiled and in a small, kind voice, said “it’s totally ok! 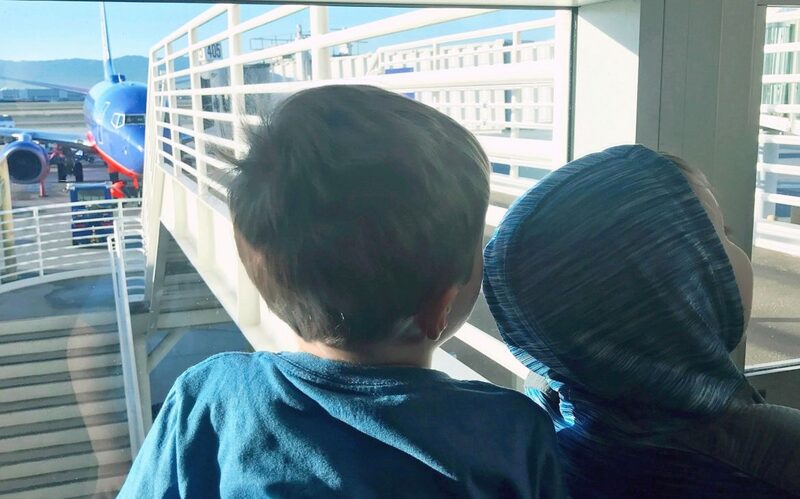 They’re cute.” And he waved at the boys before disembarking. I had been stressing for no reason! Don't Be Afraid to Travel With Your Kids! In summary, it is totally possible to fly with your young kids. Don’t let fear stop you from a great family adventure. Just be prepared for all the various situations that may pop up (like a surprise bloody nose from dry air upon touchdown…that was fun…), and be smart about your planning. 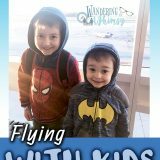 What is the craziest thing that happened to you while flying with your kids? Tell us in the comments below!